“We’re very excited about the kick start shale gas can give to British manufacturing. This is a world first and I am incredibly proud of everyone involved in this hugely ambitious project,” said Jim. 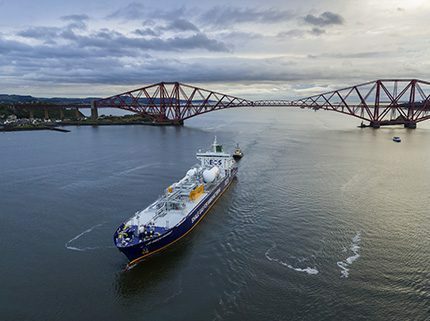 The ship’s arrival represents the culmination of five year’s work and a $2 billion investment by INEOS which sought to create a virtual pipeline from the US to provide British industry with the chance to benefit from US shale gas economics, which have done much to revitalise manufacturing in the USA. INEOS will use the ethane from US shale gas in its gas cracker at Grangemouth, both as a fuel and a feedstock, replacing the reducing gas extracted from the North Sea. With pipelines from Grangemouth to the east and west coast, INEOS sites in England will also benefit. The next stage of development at Grangemouth is the creation of a chemical cluster where INEOS will work with Scottish Enterprise to create a new home for chemical and other types of manufacturers. Combining Scottish industry with state of the art facilities, the new supply of feedstock offers a competitive advantage enabling Scotland to compete on the world stage in chemicals and other types of manufacturing. “In 2013 our immediate hope for Grangemouth was survival,” said John Mc Nally, CEO of INEOS O&P UK.